All building permits must be submitted one week prior to the Historic District Commission Meeting date. No building or other structure shall be erected, moved, added to or structurally altered or use of land be changed without a permit. No permit shall be issued except in conformity with the provisions of the ordinance, as required by the application. If the building site is in the Historic District, the Historic District Commission may require a certificate of appropriateness. Building permits shall expire one (1) year from the date of issue if work has not begun. If the work described has not been completed within two (2) years, the permit shall expire. Failure to obtain an approved permit before starting construction is a violation of Article 10, Section 4 of the Zoning Ordinance. This is a misdemeanor and is punishable by a fine of not more then $100 or imprisonment for not more than 30 days, each day the violation continues. 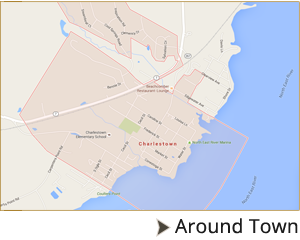 All major permits and some minor permits must be reviewed by the Charlestown Planning and Zoning meeting which are held on the 1st Tuesday of every month. The permit must be submitted at least (2) weeks prior to the scheduled meeting. Individuals, or their representative, with a permit on the agenda must attend the meeting. Distance from the new structure (s) to the front, rear and side property lines shall be shown in feet and to scale. If the lot, or part of the lot, is in the Floodplain A13 zone, site plan/survey will need to show floodplain elevation(s) for proposed structure(s). An elevation certificate is required. If a deck is to be constructed and not shown on primary building drawings, submit a separate set of drawings for deck. All major permits and some minor permits must first receive preliminary approval from the Town Planning and Zoning Commission. After receiving county permit, return entire packet to the Town for final approval. Application will contain any further qualifications/conditions required and/or applicant will execute any other certifications required by the Town. Example: At the foundation/footer stage, as-built drawing or full-blown survey, as stated in permit, must be done and reviewed by the Town before proceeding with further construction.